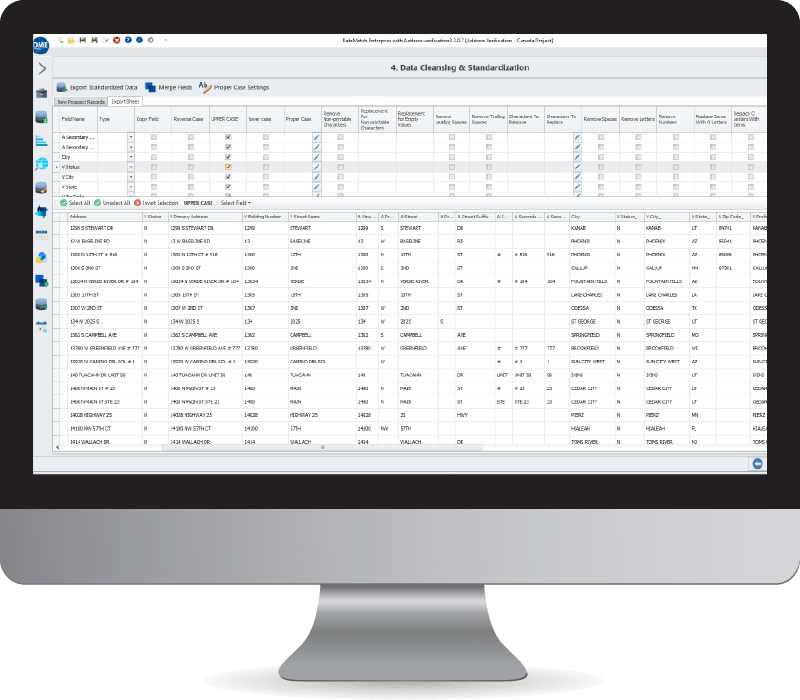 Integrate with any data source seamlessly and maximize the success of your marketing, CRM, sales, or business intelligence initiatives with accurate, trustworthy, and fully scrubbed data. Research reveals that 25% of the average B2B database is inaccurate, with almost every business admitting that their overall data health is unreliable. Critical business processes such as lead generation, finance, customer relationships, and marketing are most affected by data quality issues. As a result, bad data costs US businesses upwards of $611 billion annually. Human error: incorrect, inaccurate, inconsistent, or duplicate data entry. Data decays every month because of changes in jobs, addresses, phones, etc. Lack of data governance processes results in unstandardized records. Nicknames, name variations, and company abbreviations cause duplicates. Links between similar records are not recognized because of incomplete information. Source to target field mapping issues can result in jumbled up data during systems migrations or merging. Data scrubbing, also called data cleansing, is the process of identifying inconsistencies, inaccuracies, incompleteness, and otherwise messy data and then scrubbing it into a clean, standardized format for use across the enterprise, especially for downstream analytics applications which support business processes and decision-making. Data scrubbing software achieves this by first profiling data, applying standardization techniques, and then matching entities across organization-wide systems or within a data set for enrichment and deduplication purposes. Develop an accurate understanding of your data to develop data scrubbing strategies and achieve the desired data quality. Import one list or multiple and scrub hundreds of millions of records at a time using standardization libraries and data quality rules. Match and scrub within and across systems (databases, files, data lakes, social media, CRM, etc.) with your data scrubbing software. Work faster and better with cleansed and scrubbed data you can trust – prepared to power core business processes. Rated faster and more accurate than IBM and SAS, DataMatch consistently had the least number of false positives in independent studies. Deduplicate and enrich your data with proprietary fuzzy, probabilistic algorithms, paired with phonetic and deterministic techniques. Clean your data by applying proper casing (john smith becomes John Smith), removing certain characters in bulk, and more. Parse address, email, product, entity, and other data with customizable parsing capabilities for mass scrubbing and standardization. Data is the most important asset in our information-based economy, with enterprise data spread across 65 systems on average. A greater variety of data sources, as well as better information-tracking, means businesses now have more data than ever before, but it is also dirtier than ever before. Data scrubbing tools can eliminate many common human errors, such as incorrect spelling, improper formatting, or missing zip codes. The result is higher operational efficiency and fewer wasted resources. Define and Plan: Identify the data that is important in the day to day process of your operation. Identify fields that are critical to your goals, and define validation rules accordingly to standardize your data. This may include job title, email address, or zip code. Assess: Understand what needs to be cleaned up, what information is missing, and what can be deleted. Exceptions to rules also need to be set up – that way, the data cleansing process will be easier. Execute: It’s time to run the cleansing process. Create workflows to standardize and cleanse the flow of data to make it easier to automate the process. Investigate, standardize, match, and survive data sets as necessary. Review: Audit and correct data that cannot be automatically corrected, such as phone numbers or emails. Define certain fix procedures for future use. Manage and Monitor: Evaluating the database is important after the cleansing process is complete. Track the results of any campaigns that ran with the cleansed data, such as bounced emails or returned postcards through reporting functions. Core business processes impacted by data scrubbing include marketing, sales, and customer relationships. 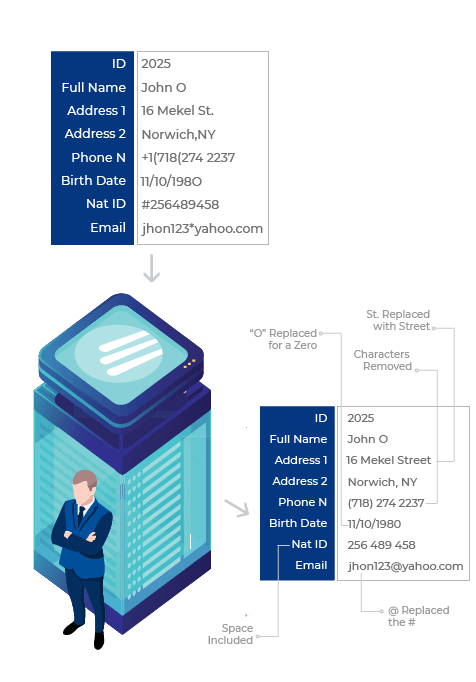 Your data scrubbing tool can help eliminate mistakes from and validate mailing addresses and phone numbers, improving marketing deliverability. It unifies sales lead data to create complete profiles that your sales team can use to make better pitches over more channels. It improves customer relationships by providing your team with accurate historical data of customers. Data scrubbing is also a crucial step before Big Data analysis. Data scientists claim to spend 80% of their time preparing and scrubbing data to make it useful for analytics, and only 20% actually analyzing that data. Automated, visual data scrubbing software can be used to dramatically cut down data preparation time and improve predictive analytics for Big Data. Ready to Start Matching to Clean, Enrich, and Prepare Your Data? During your 30-day trial, you can access DataMatch Enterprise™ risk-free. The software is user-friendly and easy to install – what you see is what you get! However, we recommend a 30 to 60-minute non-obligatory online consultation with one of our subject matter experts to help you get the most out of your free trial.